The new wardens in front of the CCTV van. The picture also features Richard Mitchell (far left), manager of the community protection team; Coun Carl Johnson (centre), cabinet member for housing and transport; and Coun Carole Burdis (far right), cabinet member for community safety. Covering all areas of the borough, the van will be used to tackle environmental offences – such as dog fouling, littering and fly-tipping – and anti-social behaviour in public places. As well as wardens issuing on-the-spot fines, the CCTV footage will be used to help with prosecutions. The extra wardens will work within North Tyneside Council’s community protection team and an apprentice has also been recruited to join the team. They will operate from early in the morning until late at night, including weekends, to catch any perpetrators and be present in communities and schools to educate and advise. North Tyneside’s Elected Mayor, Norma Redfearn, said: “North Tyneside is a brilliant place to live, work and visit and it remains one of the safest places to live in the country. 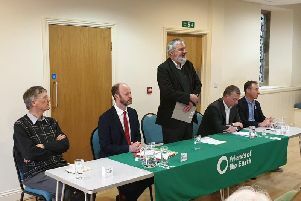 “That being said, residents have told me that they have some concerns – particularly around littering and dog fouling issues. “This council is one that works better for residents by responding to any issues and changing how we work for their benefit.